“Speedy” in comments on this site has done a better than excellent job of satirizing the satirists (Clarke and Dawe), so I’m reposting one of his comments here for those who missed it. See the bottom of the post for the background on the duo he is satirizing and a youtube of them. Speedy has very much captured their style. If the ABC was relevant, Part 32. John: G’day. I’m here about the climate. John: Your climate. Our climate. THE climate. I’m here to fix it. Bryan: What’s wrong with it? John: It’s buggered. Absolutely buggered. Bryan: No it isn’t. I was using it this morning. Bryan: For drying the washing out the back. John: Spoken like a true layperson! What you have just witnessed was not the working of an healthy climate, but a clear manifestation of catastrophic global warming! Scientists warn that if current trends continue, solar drying of your clothing will cause it to be not only dried, but pressed and lightly toasted as well! Bryan: I don’t believe you. John: You have to believe me! Bryan: What about the models? John: They’re excellent models. Very robust. Bryan: What makes you say that? John: They all reach the same conclusion – they agree with each other. Bryan: They don’t happen to use the same input numbers, perchance? John: There is a level of collaborative effort, yes. Bryan: And they all use atmospheric CO2 level as a major input? John: Because atmospheric CO2 level is a significant driver of global climate. Bryan: So what do all of these “robust” models conclude? John: That atmospheric CO2 level is a significant driver of global climate. Bryan: Funny that. You know what? John: But the climate record! The long term climate record! Bryan: Which goes back how far? John: As early as 1850 – the dawn of the Industrial Revolution. Bryan: Even though global temperatures have gone down, as well as up, during that period? John: The downward cycles were simply the earth’s natural variation. Bryan: But the upward cycles are global warming? Bryan: No chance that the upward cycles aren’t natural variation as well? John: Of course not! They wouldn’t be man-made then, would they? And anyway, the trend for the last 150 years clearly shows a long term warming trend, interspersed by some decades of cooling. Bryan: Sort of expected, really. Bryan: Sort of expected. If you’re coming out of a little ice age, then you expect things to be warming up. Otherwise you’d still be in the little ice age, wouldn’t you? John: I think you’ll find that the little ice age (LIA) did not, in fact, occur. Plus, it was only a localised event of a strictly transient nature. The peer-reviewed literature clearly demonstrates a stable global climate up to the time of the Industrial Revolution. Bryan: You mean the hockey stick? Don’t make me laugh! John: This is no laughing matter, my good man. The peer-reviewed literature clearly shows that temperature was benign and stable until the intervention of mankind. Bryan: You mean YOUR peer review literature? As reviewed by people who are paid to agree with it? As discussed in the Climategate© emails? As distinct from the geological, sociological, archeological, oceanographic and historical evidence to the contrary? John: That comment was not very helpful. Bryan: Suit yourself, but I still don’t believe you. John: What about the rising sea levels? You can’t deny the rising sea levels. Scientists believe that sea levels around the globe are rising due to the effect of the melting ice caps. Bryan: Of course. And they’ve been rising for about 8000 years – just after the end of the last major ice age. Haven’t noticed anyone taking a walk from Russia to Alaska lately, have you? John: The Barents Sea would be a bit of a problem, no. Bryan: That’s because rising sea levels covered the land bridge a few thousand years ago. Well before SUV’s became fashionable, you’d agree? Looks like natural variation to me. John: I reject your reality and substitute my own. John: No, I’m a Climate Scientist. And if you don’t believe me, just look at all the catastrophic climate events over the last 20 years. The droughts. The heat waves. The glaciers. The snowstorms. The floods. Can’t you believe your own eyes? Bryan: So global warming causes droughts? AND floods? Heatwaves AND snowstorms? John: The floods and snowstorms were only weather events, of course. Bryan: Just like the decline or plateauing of the global temperatures these last 10-15 years, I suppose? John: You are being very unreasonable – I can see this conversation is not going to take us anywhere. The science is settled, the debate is over. I think it better if I left now, without fixing your climate. Bryan: OK, but before you go I’ll just give you a demonstration of the Carbon Tax. John: Jolly decent of you. Bryan: Care to show me your wallet? Bryan: Now, I’d like you to open your wallet, close your eyes and think nice thoughts about Gaia. Bryan: Thank you for saving the planet. [Shuts door.] And I still don’t believe you! Here in the land of OZ, on our ABC (public funded TV, ie arm of big-government) there is a duo called John Clark and Bryan Dawe who do a weekly prime-time spot. Their pattern is to pretend to be a politician or two and bat questions back and forward. At the bottom of this post is a Youtube video of them on “Climate Change” from two years ago. You can see an archive of them here. Deadpan is the usual delivery. But because the ABC is about 20 years behind in the real news on Global Warming, Clark and Dawe work with the disadvantage of being ABC viewers. This is a real handicap for comedians, since to be funny, you have to be one step ahead of the audience. Thanks to Speedy for sharing his talent. He’s captured the pair’s “voices” and genre to a tee (even though I’d actually be shocked speechless if I heard them say this on the ABC). 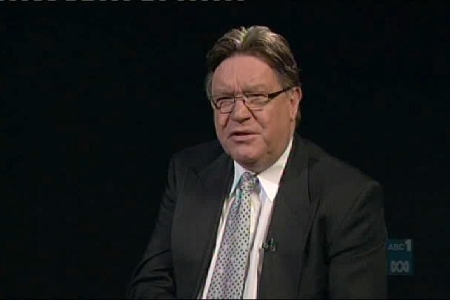 Robert W, and George J have both found another copy of a Clarke and Dawe “Climate Change” video here. Thanks! has just summed things up perfectly. Why can’t that be on a billboard somewhere? I love it when Speedy does that! What can I say. You’re the man! I don’t know how you feel about Andrew Bolt but further to my post the other day on ridicule of the AGW claims being a good counter weapon, have you considered approaching him with a view to having a regular spoof section on the Brian and John interviews or some variation of them included in his Bolt Report, copyright permitting? Our side of the debate has had so little opportunity in the MSM to show an alternative view to the much trumpeted “consensus” and “science is settled” mantras, we must make the best of the opportunity now. All power to you speedy! Great post all round. Speedy’s take is priceless and it would be nice to have wider coverage. There is nothing like ridicule to upset a leftie. The left just don’t do humour. Have you ever noticed an accepted left stand up comic? Take out the foul language and the slurs on conservatives and they are positively silent. I have posted two of his comments in my forum headed under the subforum,Comment discussions from outside the forum. A growing collection of comments I think are worth collecting. Dang!!! YouTube says the video has been pulled!! I copied this from the original thread and forwarded it to a few friends, some of them actually took it to be Brian and John’s own work. As an aside people in my workplace are openly discussing skeptical views on CAGW, such a change from a few years ago, I can see where the 80% has come from in recent polling. Now I also get some street-cred by being able to say I was into Speedy long before his string of sell-out stadium performances. I was thinking about the wisdom of the crowd versus command economies over my lunch-time walk and it occurred to me; free markets are self-correcting, experts not so much. It was great I love those two. Hide the decline is still on U tube despite that Michael Mann is sueing over it. and Tony Windsor, my rep.
“That’s why free markets work and command economies don’t. Or consider the TV show “Who Wants to Be a Millionaire?” When a contestant got stuck on a question and was allowed to ask an expert of his choice, the expert gave the right answer 65% of the time. But when the contestant polled the audience – a random group of people with nothing better to do on a weekday afternoon than sit in a TV studio – they picked the right answer 91% of the time. I am not responsible for the picture quality. Question: What is an expert? Answer: Somebody who knows a great deal about very little! A generalist, on the other hand, knows a little bit about a wide range of subjects. The quantity of knowledge (if you can measure such a thing) is comparable in both cases. But the generalist can see the interconnectedness in the world, they can see the cause and effect acrossa wide range of disciplines, and not just within a set of closely related disciplines. So I would argue that asking a generalist for an opinion, on almost any topic, would have a greater chance of getting a reasonable answer than asking a random specialist. EXACTLY! If “our” ABC were relevant as a truly national broadcaster, then this is exactly what Clarke and Dawe would be doing anyway! I sometimes wonder whether Clarke and Dawe feel like they’re writing the comics for Pravda. KERRY O’BRIEN: Not any more. Murray McLaughlin with that report. Well, everyone else has expressed their view on climate change this week, why not John Clarke and Bryan Dawe for the last word. BRYAN DAWE: Mr Howard, thanks for your time. JOHN CLARKE: It’s my great pleasure Bryan, as well you know. BRYAN DAWE: That wasn’t too biased, was it? JOHN CLARKE: No, it’s going pretty well at the moment. But I would counsel caution, you can’t be too careful. BRYAN DAWE: Mr Howard, I would like to talk to you about global warming and climate change? JOHN CLARKE: Global warming, did you say? BRYAN DAWE: And climate change. What is Australia doing about it? JOHN CLARKE: Hang on, hang on. Global warming. BRYAN DAWE: And climate change. JOHN CLARKE: Global warming. OK.
BRYAN DAWE: And climate change. The globe is getting warmer, Mr Howard. JOHN CLARKE: The globe’s getting warmer? So when is this going to happen? BRYAN DAWE: It’s happening now. JOHN CLARKE: Do you want to discuss that as well? BRYAN DAWE: Well, yes, it’s the same thing. Global warming means the globe is getting warmer. JOHN CLARKE: Globe warming means the globe is getting warmer? Well, we’ll come to that under global warming, won’t we? BRYAN DAWE: Mr Howard, the seas are rising. We’ve got climate change and Australia is one of the worst affected places on earth for all this. JOHN CLARKE: Other than global warming, what was the other thing you mentioned you wanted to cover? BRYAN DAWE: Climate change. The climate is changing, Mr Howard. We’ve had one of the hottest Octobers in donkey’s years? BRYAN DAWE: And it’s urgent we do something about this. JOHN CLARKE: Urgent. It’s urgent. BRYAN DAWE: Yes. Mr Howard, it’s been urgent for 10 years. JOHN CLARKE: Urgent, did you say? BRYAN DAWE: Yes, urgent for 10 years. JOHN CLARKE: How do you spell ‘urgent’. JOHN CLARKE: Looks wrong. I’m trying to get this down. JOHN CLARKE: Looks better in capitals. So, we’ve got global warming. JOHN CLARKE: And it’s urgent? BRYAN DAWE: It was urgent 10 years ago, Mr Howard. JOHN CLARKE: Is it still urgent? BRYAN DAWE: Well, of course it is. JOHN CLARKE: We’ll just discuss that under urgency. BRYAN DAWE: Mr Howard, what is Australia doing about climate change and global warming? JOHN CLARKE: Climate change and global warming? Sorry, I’ve got them the wrong way round. Is it still urgent, is it, Bryan? JOHN CLARKE: Can we get some water, please? BRYAN DAWE: We don’t have any water. JOHN CLARKE: Don’t be silly, Bryan. Urgent. KERRY O’BRIEN: And that’s the program for tonight and the week. Don’t forget Stateline this time tomorrow. We’ll be back with the 7.30 Report on Monday, including our Melbourne Cup preview. But, for now, goodnight. Ho hum. Not so funny, is it? Speedy’s parody is much better than the original, imho. Agreed. Interesting isn’t it, because the [non] problem of CAGW is inherently multi-disciplinary. We should be very wary of anyone claiming to be an expert – how could they be? Who then are these qualified experts on CAGW? Is it the climatologist, the atmospheric physicist, the economist, the organic chemist, the paleogeologist? Each understands only a part of the overall process; somewhat like a car, no-one person has all the knowledge required to produce a car from scratch and make it work. The complexity of the system we’re talking about makes the repeated appeals to authority much less relevant. OT but check out Climate Spectator today. Disgusting article by Clive Hamilton reprinted there. The guy is a loon and the article exhibits a classic case of projection. The whole Climate Spectator is of course just a bunch of carpetbaggers trying to make some money out of nothing. They refused to publish two rather mild criticisms of the article by me, the first chastising Clive for not mentioning the Ben Santer “I’d like to beat the crap out of Pat Michael”, the 10-10 video, the bugf**k crazy fellow who wants to tattoo our denialism on us (hint: Send armed men when you come for me, feller) etc and the second for querying whether the article itself met their own guidelines for comment. From Alan Jone’s interview with David Karoly. I think it’s highly unlikely that you could identify a warming signal due to anthropogenic Co2 emissions in data with so many [poorly] quantified variables, or even demonstrate the lack of a warming signal for that matter. It’s an audacious claim. Suppose there really is a modest (but diminishing) warming signal (due to anthropogenic Co2 emissions) hidden in the data. The effect is so weak that the planet still does what it likes regardless, it’s not strong enough to tip the scales, to stop cooling (or warming) when other stronger cyclical factors (the REAL drivers)kick in. To me, trying to tease out a warming signal smacks of trying to find satanic messages in pop songs by playing them backwards. You’ll find them if you look hard enough. The advantage the AGW guys have got is that they know EXACTLY what they’re looking for. (i.e.Man-made global warming.) And, surprise, surprise, they ALWAYS manage to find it. Speedy’s best by far! And one doesn’t need to have any understanding of the background or Australian political intrigues to appreciate it. This one stands on its own. You’ll know it’s all over when the ABC broadcasts the “The Repairman” and “Four Corners” does an exposé on Climategate. Interestingly my local ABC radio in QLD ran an excellent interview this morning with physicist Prof Brian O’Brian. In the last 5 mins of the interview AGW was brought up, to my great relief Prof O’Brian revealed he does not belong to the “consensus” and does not agree with the carbon tax. Thanks – I appreciate your concern. Would it help if we called it a consensus? He is a very wise, logical and ethical man, and I’m not going to pick an argument with him (or you) on this subject. All that I was trying to do in this little skit was to counter some of what I thought was the sickening propaganda from “Say Yes” et al. I was asking people to consider some of the underlying issues with the alleged “science” of global warming. No doubt, you will also be sickened to see people turning off their brains to watch a pretty actress performing against the scene of a long-since demolished power station (Battersea – pardon the spelling). Where carbon dioxide is deliberately confused with soot. Where bland assertion replaces reasonable and logical fact. I find this offensive – no doubt a free thinker like you will agree! * The climate models are contrived. * The AGW paleoclimate has been stacked to the exclusion of obvious alternate conclusions. * AGW climate “reporting” is no more than opportunistic propaganda making hay from the miseries of others. You are welcome to challenge these ideas if you like. There are many other holes in the AGW “hypothesis” but I only chose these for this occasion. At this site, you will find lots of others (Bulldust, Cohenite, Wes George, Rereke, Jo, Richard, Bush Bunny, Jo Nova, Madjack etc, etc) who can give you many more examples. But, as a scientist, I know that a scientific theory only needs one fatal flaw for it to be dead. And that is where AGW is, logically speaking. Each of us has to decide what the right balance is between being effective and being honest. I hope that means being both. I wonder which option he actually chose for this video? As for me, I am not ashamed of the path I used. thanks Speedy for the laugh!